Books on First Blog: CAA Student and Star Grandson Jack Dunphy Selected for CineYouth Festival! CAA Student and Star Grandson Jack Dunphy Selected for CineYouth Festival! 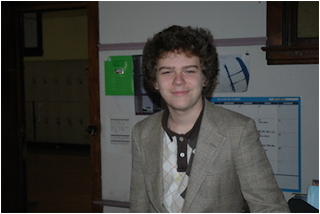 The film "Tom’s Christmas" by Chicago Academy for the Arts filmmaker Jack Dunphy (CAA’11 - pictured below) has been selected for the 2010 CineYouth Festival, presented by Cinema/Chicago. The festival “showcases and celebrates... the talent and unique vision coming from filmmakers 20 years old and younger.” You can see "Tom’s Christmas" during an official screening at Columbia College early in May; more details can be found here.